By Jeff Aranow: Promoter Eddie Hearn says WBO middleweight champion Billy Joe Saunders will be defending his title against former WBA/WBO junior middleweight champion Demetrius Andrade (25-0, 16 KOs) on October 20 at the TD Arena in Boston. 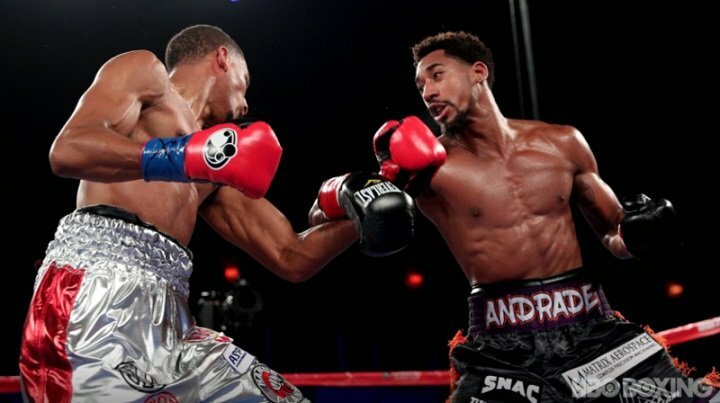 Hearn recently signed the 30-year-old Andrade to his Matchroom Boxing USA promotional company with the intent to have his fights televised on DAZN subscription cards for U.S fans. Hearn says the original idea was have Andrade take a couple of tune-up fights before looking to put him fight for a word championship. However, when the World Boxing Organization suddenly ordered Saunders (26-0, 12 KOs) to defend against Andrade, then it left Hearn with no choice but to make the fight. Andrade wasn’t going to turn the fight down because it’s a winnable one for him. Andrade can change his destiny if he beats Saunders to take his WBO title. It would put him in position to possibly fight the winner of the September 15 rematch between Saul Canelo Alvarez and Gennady Golovkin. There’s a lot of money to be made for Andrade if he beats Saunders. Not only would he become the new WBO champion, he might get a big payday against Canelo or GGG. It’s a win-win for Hearn, because he could stick a fight between Andrade vs. the Canelo-Golovkin 2 winner on DAZN and get boxing fans to subscribe to the streaming service to see the fight. ”In Boston on October 20 at the TD Arena,” Hearn said to AB Boxing News. ”Andrade vs. Saunders is one of the best matches in the middleweight division. It’s a 50-50 fight. We signed Andrade. The aim was to give him a fight or two and then fight for a world championship. The WBO called the mandatory, and Andrade said, ‘I’m in.’ I said, ‘Wow, that was quick.’ It’s a great fight. It’s going to be a big fight in Boston,” Hearn said. It’s not going to be easy for Andrade to beat a slick southpaw like Saunders, as he’s fighting at a high level right now. Saunders is coming off of a confidence boosting 12 round unanimous decision win over former IBF middleweight champion David Lemieux last December. After that fight, Saunders was scheduled to defend against Martin Murray. However, the fight fell through after Saunders was twice injured during training camp. A lot of boxing fans doubt whether Saunders was really injured. Many of them felt that Saunders pulled out of the Murray fight in order to be on standby if the Canelo vs. Golovkin 2 rematch didn’t get made. Andrade hasn’t fought since October of last year when he beat Altantez Fox by a 12 round unanimous decision. It’ll have been a year out of the ring by the time Andrade fights again. It’s going to be tough for Andrade to return to the ring after that kind of a layoff to face Saunders. It’s difficult to know how well Saunders will go against a good fighter like Andrade. Saunders looked great against Lemieux, but he’s not a good fighter with the height, reach of the same amateur background that Andrade possesses. This is a fight that the 5’11” Saunders could lose. He’s not going to be the taller guy at the 6’1″ southpaw Andrade, and he won’t have an advantage against him due to his southpaw stance.